Welcome to Redondo Beach! - ZineWiki - the history and culture of zines, independent media and the small press. 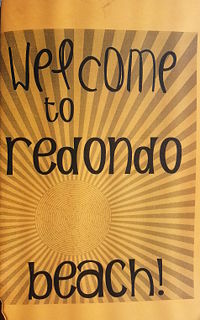 Welcome to Redondo Beach!, published in September, 2013, is a one-issue zine by Kari Tervo. It is 24-pages in a half-size format. It has black-and-white content with an orange cover. It was published in California, U.S.A. The zine takes the reader on a photo walking tour of Redondo Beach, California on a sunny day. Sections include: Around Town, Riviera Village, Esplanade, and The Beach. The center spread features a beach photo background and a poem, "Redondo Beach." The photos throughout are accompanied by light descriptive and narrative captions. Welcome to Redondo Beach! is Kari Tervo's first all-digital zine. It was created using the open-source resources Scribus (desktop publishing) and GIMP (image manipulation). It pretty much looks like her cut-and-paste zines. Give her some time. This zine has a sequel, Welcome BACK to Redondo Beach!. Libraries Carrying Welcome to Redondo Beach! This page was last modified on 13 May 2015, at 22:55.